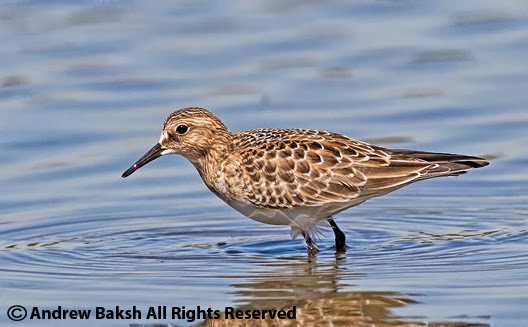 Interestingly the Baird's Sandpiper, which is often associated by its preference for dry areas to forage, will also venture into the water as shown by this photograph. This is a juvenile bird as noted by the buff face and breast, as well as the bold white scaling on the upperparts. Despite the paucity of birds, I managed a decent showing over the weekend while birding on Long Island. Most of my birding occurred at Jones Beach covering the West End area. Migration was minimal and as a result land birds were scarce but as I have found out with a little patience and work one could find birds. For lands birds, a YELLOW BREASTED CHAT, seen near the entrance to the fisherman's path near the Coast Guard Station was a nice surprise on Saturday. On Sunday, a pale looking Myiarchus had me wondering if it was something other than Myiarchus crinitus. Despite a good effort to relocate it, I was not able to re-find it and I am letting it go as a pale looking Great Crested Flycatcher although not a young bird because my scope views showed an adult bird with very worn tail feathers. The other notable bird on Sunday was a Caspian Tern that stayed for a few minutes then took off heading towards Point Lookout. Shorebirds were in small numbers and the best birds were seen on Saturday when I managed AMERICAN GOLDEN PLOVER, PECTORAL SANDPIPER, RED KNOT and my best bird of the weekend a DUNLIN in juvenile plumage. I was alerted to the presence of the latter by my friend Michael McBrien and together we spent some time studying the plumage. The opportunity of seeing a Dunlin in juvenile plumage this far south from the breeding grounds is a rare one. 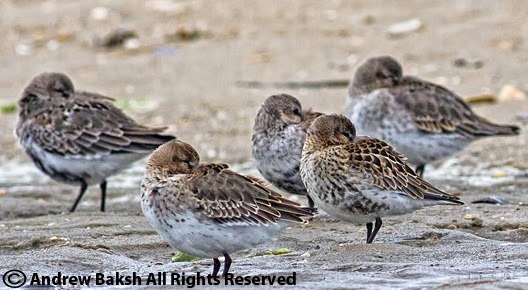 All of the juvenile Dunlins I have seen in New York, were always into their Pre-basic molt by the time they arrived so this was quite the treat for me. 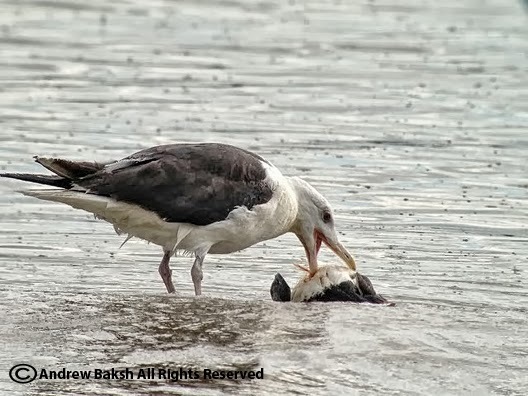 The only other eventful occurrences at Jones Beach were TWICE observing a Great Black-backed Gull taking out an Oystercatcher both on Saturday and Sunday. I have some video capture which I will upload at some time but I will warn viewers that it is not for the faint of heart. The other really neat observation was the some 2,000 plus Tree Swallows that were putting on a display at first near the exits of the West End II parking lot and then moving on to other locations on the beach. They would swirl around in this huge vortex and land in the parking lot where they would rest before taking off again. Really neat to watch. At one point while looking at them, I was surrounded by Tree Swallows on the ground mere feet away from me. 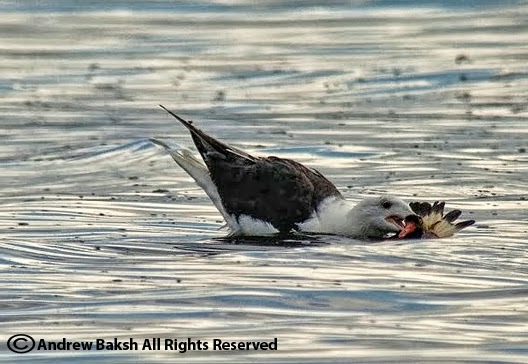 Great Black-backed Gulls are just badass! I just witnessed an Oystercatcher getting taken down and eaten alive. 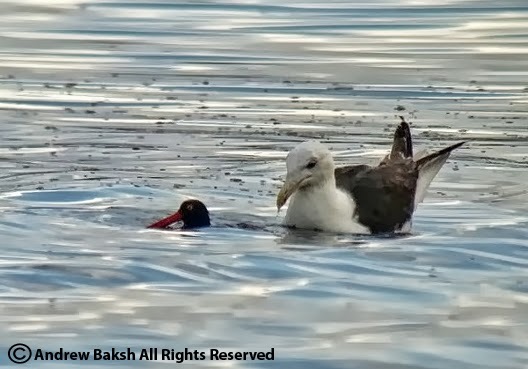 As the MO seems to be with other Great Black-backed kills that I have witnessed. They always seem to sidle up to the unsuspecting victim and without bating an eyelid pounce and annihilate. These gulls are just badass! I have some video footage which I will post later but for now, check out these photos. They tell a gruesome story. Late yesterday afternoon around 6:30 p.m. I was working a patch along the path of the triangle of Kissena Corridor. This would be the path north of the artificial football field and is covered with wood chips. While working the area, I found a bird that took some time for me to get a decent enough look and when I did, I realized I was looking at a Vireo sp. that I was not familiar with. It was small like a PHILADELPHIA VIREO but had wing bars and I immediately thought of HUTTON'S VIREO but ruled it out after I got better looks. After a few minutes I began to get a clear picture as this active bird gave very shy looks and did not really come right out into the open. By then I ruled out Warbler sp. and focused in on Vireo sp. It looked small enough for a Philadelphia Vireo but with wing bars??? After several minutes of patiently working the area, I finally got a decent enough photo of the bird. 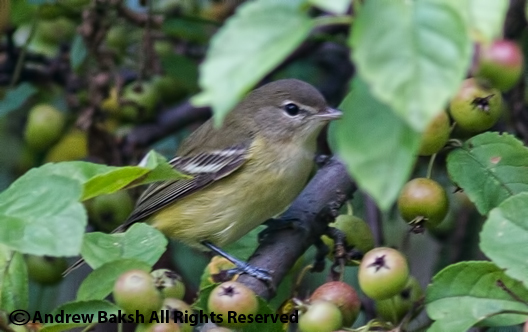 To me it looked like a good candidate for a BELL's VIREO (perhaps the Eastern race). The bird was last seen working its way back into the tickets and I did not pursue it, but instead chose to jot down as many notes as I could. After getting back to my car and consulting field guides, I called a few people and provided a description of the bird and sent out a photo from the screen view of my camera. I received word from one non NY birder who, is well known for his field work, published articles and talent. I have tremendous respect for him and he was very helpful with the ELEGANT TERN ID confirmation. 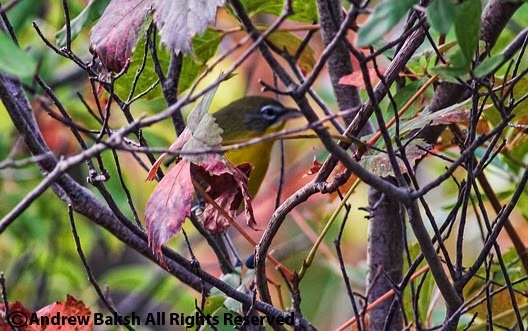 His response was, "it is a Bell's Vireo"; although, he did admit to not having enough experience to determine the subspecies. I did not get permission to use his name, so I won't until I get the green light. 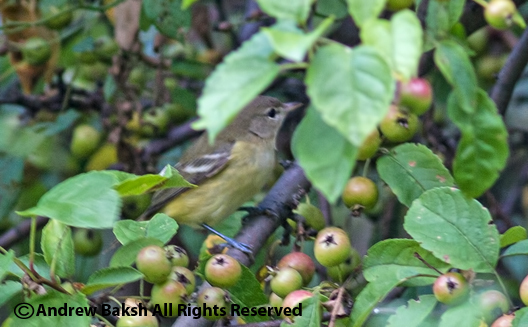 Around 6:30 p.m. observed small like bird that turned out to be a Vireo sp. Better looks showed this bird to be small almost like a Philadelphia Vireo but with wing bars. It can't be a Philly Vireo?? But what could it be? Color: Yellow wash down the sides that got brighter towards the flanks and the undertail coverts. Back: Greenish/Olive looking with some white detected on the edges of the "tertials"
Spectacles: None but pale looking eye ring. Wing Bars: Yes, Upper bar faint looking while lower bar prominent and looked wider. Legs: a gun metal type hue. Not black! Behavior: Very active and hard to see as it moved around in the thicket and Crab Apple trees (I think that is what the fruit was). Flicked tail as it moved around and even fanned its tail once quite like an American Redstart; this behavior was displayed when a Common Yellowthroat got near it. Sketch: None, but photo obtained. Here are the few images I managed. 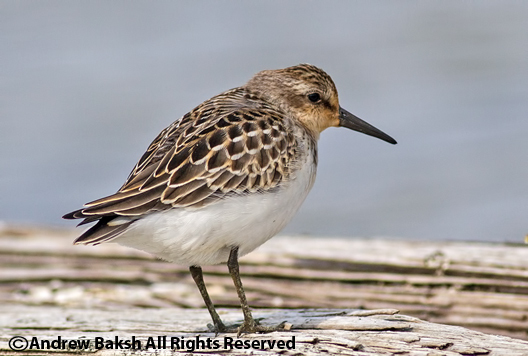 Here are the answers to last Monday's Shorebirding Quiz: Dunlin, Pectoral Sandpiper, Semipalmated Sandpiper and Western Sandpiper. 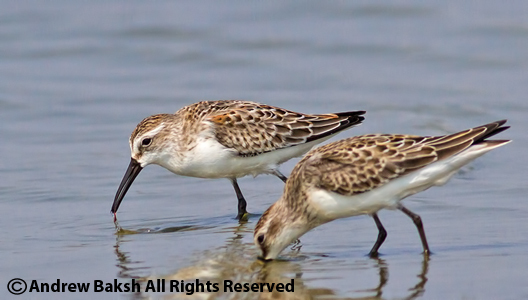 Note that the Dunlins were juveniles molting into first winter plumage. 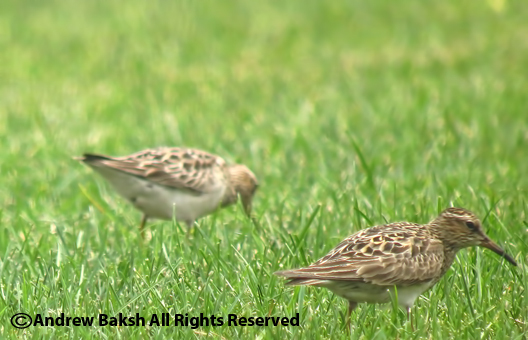 Here is a partial blown up image from the quiz that should help in identifying the shorebirds. Take a look and then go back to the Quiz and see if you could find the others that are not in this blown up image. Although the shorebirds have been in small numbers, I keep checking the East Pond at Jamaica Bay to see if anything new or noteworthy would drop in. It so happened, that yesterday I happened upon the first Godwit of the year that I am aware of on the pond. A Marbled Godwit, just happened to be hanging out amongst the several hundred Double Crested Cormorants that have invaded the pond and took off flying right by me just as I spotted it. Later on, I came upon a nice looking Western Sandpiper feeding among the Semipalmated Sandpipers, which provided a good comparison of the two species. 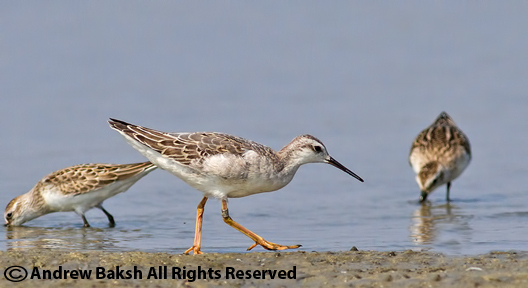 A Juvenile Stilt Sandpiper added to the diversity on the pond and provided very nice looks. But the surprise of the day was a Wilson's Phalarope that was feeding actively. This bird had a band and the first such documented bird for me. Overall, there was not a lot of shorebirds but the diversity of the number of species seen was not too bad. In total I saw 17 species of shorebirds and that is not a shabby number for this time of the year at all. 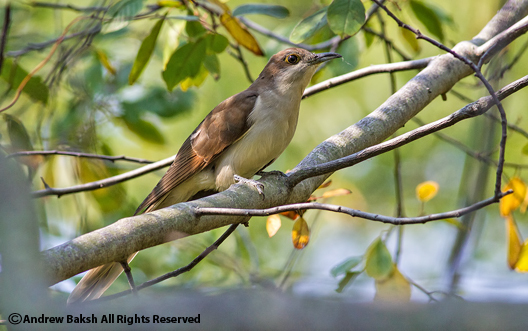 On the non shorebirding front, I had very nice looks at a Black-billed Cuckoo with a birder named Jonathan. National Park Service is having an open house this evening at the Jamaica Bay Wildlife Refuge Visitor Center. This meeting is to discuss their recent GMP (General Management Plan) for Gateway National Recreation Area. Check back for more information as I plan on attending. 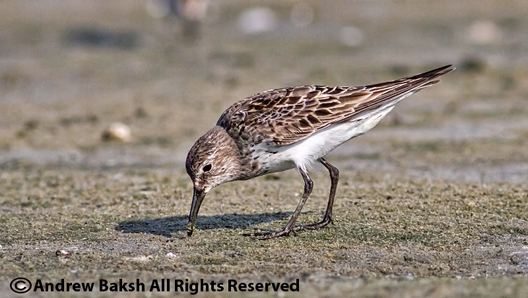 The answers to last Monday's shorebird Quiz are: Semipalmated Sandpiper, Least Sandpiper, Semipalmated Plover and Sanderling. Here is Quiz number 3. 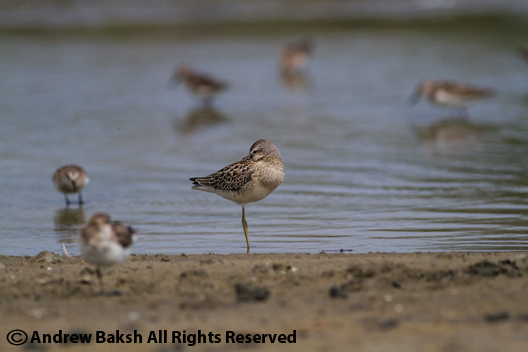 Identify the shorebird species in this photo. Apply the lessons you may have learned from Quiz 1 and 2. Good luck! Despite the focus on the warbler migration, I have not yet given up on shorebirding at Jamaica Bay in Queens NY. Today, I did some birding on the East Pond and I was disappointed at the lack of volume of birds. However, I was happy to look at what was there and in doing so managed to find some variety. In addition, I also saw several White-rumped Sandpipers and one in a plumage that I don't often see on the East Pond, much less able to get photo documentation. It looks like a bird that has already seen some molting occurring. Arguably a non breeding bird?? 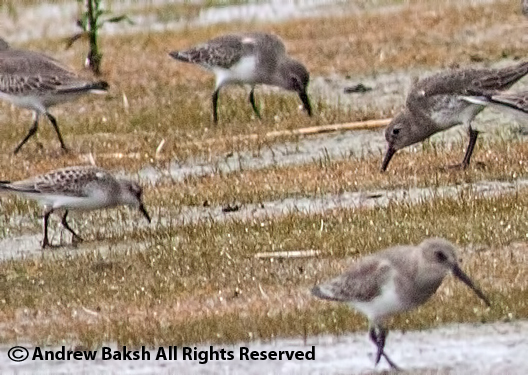 A juvenile Eastern Willet and 2 Solitary Sandpipers at Big John's Pond added to the diversity. Another interesting bird was an "oiled" Semipalmated Sandpiper that had this interesting look to its face. I tried hard but could not find any Baird's or Buff-breasted Sandpipers on the pond. Bizarrely, I did not find any Black-belied Plover by the time I got to the North Island and usually I would find a few even if it was during the dropping tide. So, it appears that birds pulled out last night and I could only hope that a new group arrives with tonight's wind. Keep checking for shorebirding updates! After finding a HUDSONIAN GODWIT on Saturday on the flats at Cupsogue Long Island New York, I began toying with the idea of a shorebird big day, the next day. What do I mean by that you ask? Well, this is the type of shorebirding where I would hit several known shorebird locations to maximize the number of shorebird species that I could see on a given day. Of course, this is all based on one's own honesty in not cheating. My previous high was 21 species back in September of 2010. However, given the lack of shorebirds in the area this year, I was merely hoping to break the 17 species high of shorebirds that I had accomplished 3 times already for the summer but could not get past that number. While heading back to Queens that evening, I began to develop in my mind a strategy. I decided that the East Pond at Jamaica Bay would be my first stop. Even though the shorebird numbers there were dismal in recent days, there was always a chance to get a bird I might not get out at Cupsogue Long Island where I planned on returning. My target birds at Jamaica Bay were STILT SANDPIPER, either PHALAROPES or WHITE-RUMPED SANDPIPER. All three were going to be tough out east with STILT SANDPIPER the toughest of the three. After an hour of birding the East Pond, I left with 10 species of shorebirds (SPOTTED SANDPIPER, KILLDEER, BLACK-BELILED PLOVER, SEMIPALMATED PLOVER, LEAST SANDPIPER, SEMIPLMATED SANDPIPER, OYSTERCATCHER, SHORT-BILLED DOWITCHER, GREATER YELLOWLEGS and LESSER YELLOWLEGS) possibly 11 with a potential sleeping juvenile STILT SANDPIPER documented via photograph. I felt good about the ID but was content to wait to look at the photo once I downloaded it at home. Whimbrel on the flats the day the Hudsonian Godwit was found. I departed Jamaica Bay in high spirits; feeling good because even if I did not break my season high of 17, I was having a good time shorebirding and I know I don't have to remind you my readers how much I LOVE SHOREBIRDS :) Taking a chance, I skipped Jones Beach and hauled it up to Dune Road LI. 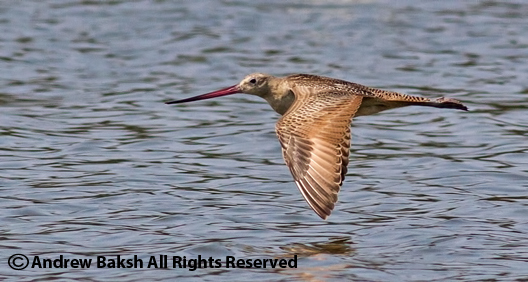 I figured that birders would be out chasing the HUGO and I was relieved to see a post from Angus Wilson who was birding with Ken Fuestel, they had the HUDSONIAN GODWIT on the Cupsoge Flats. It was still around, meaning I had a chance to add that bird to my list for the day. I called Ken and informed him to keep an eye out for an AMERICAN GOLDEN-PLOVER that Shai Mitra had picked out the day before but forget to mention that Patricia Lindsay had picked out a WHIMBREL that same afternoon, just as it landed in the flock of shorebirds that included the HUDSONIAN GODWIT. 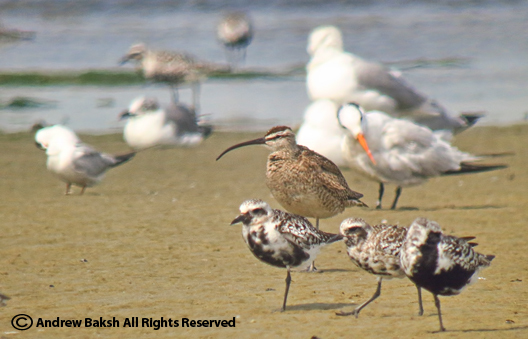 Minutes after the HUGO post, Micheal Yuan reported a WHIMBREL had dropped in on the flats. The potential number was looking good, all I had to do was see the birds. 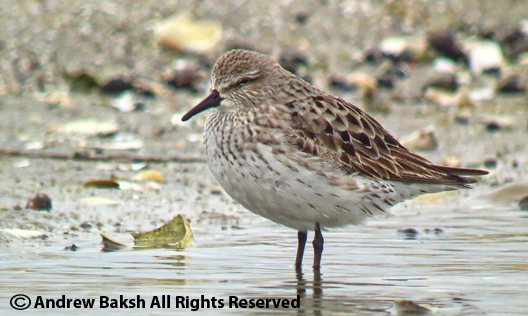 Instead of going straight to the Cupsogue flats, I decided to bird Pikes Beach in the hopes for a WHITE-RUMPED SANDPIPER. I had hoped that this was one I would have already bagged at Jamaica Bay but I could not find one. As a result, I felt Pikes was my next best shot since I did not see any on the Cupsogue Flats the day before. 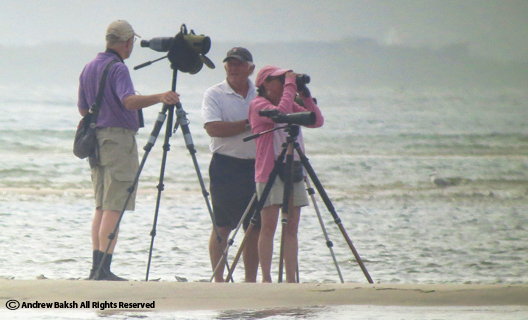 By then, Ken Fuestel had joined me at Pikes and while we were scoping one of the sandbars east of the platform, he asked me to take a look at a sleeping bird that he thought looked good for WRSA. I finally caught up with it and exclaimed in delight that it was indeed a WHITE-RUMPED SANDPIPER. I felt the sun on my face even though it was overcast with the threat of rain. I was very happy!! Ken left Pikes and I waded out to get close to the sandbar. I had spotted a banded PIPING PLOVER (another addition to my day list) and I wanted get a documentation photo (I was ready to abandon my quest just to get documentation of the PIPL, that is how serious I am about documenting banded birds). While obtaining a photo of the PIPING PLOVER, I found a banded RUDDY TURNSTONE (a first banded one for me). I also managed to get a photo of the WHITE-RUMPED SANDPIPER. With the addition of MARBLED GODWITS, WILLET (both Eastern and Western) and SANDERLINGS all at Pikes, I was up to 16 species of shorebirds. (note: this did not include the potential SITLT). Things were looking good. If I added the HUDSONIAN GODWIT and WHIMBREL at Cupsogue, I was sure to get 18 and that would break my 17 shorebird species high for the year. But then I made an adjustment to my plan and decided to gamble. This decision was made thanks to my friends Tom Burke and Gail Benson who had traveled out east that day and had already seen the HUDSONIAN GODWIT. They had stopped in at Pikes when I was on my way out and indicated that they were on their way to visit a few of Long Island sod farms in search of AMERICAN GOLDEN-PLOVER. I did not hesitate; I decided that I was going with them to the sod farms for the AMERICAN GOLDEN-PLOVER, this was a chance to add to my list and maybe get PECTORAL SANDPIPER as well. At the sod farm along Osborne Avenue, Tom, Gail and I spotted several shorebirds. Included in the bunch I added BAIRD's (huge bonus) and PECTORAL SANDPIPER, number 17 and EIGHTEEN for the day. I had broken my season high of 17. Then I added number 19 when we added AMERICAN GOLDEN-PLOVER, enjoying scope views of about 24 of then on the sod farm on Sound Avenue. I left Tom and Gail shortly after and headed back to Cupsogue. Having broken my season high, I was now thinking of a new goal. Could I break my all time shorebird high of 21 species from 2010? I counted off in my mind the birds I needed. There were four birds that I had the day before that I could potentially add to my 19. HUDSONIAN GODWIT, WHIMBREL, RED KNOT and DUNLIN. 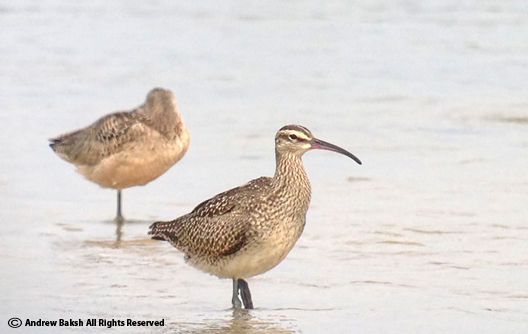 Of the four, I thought the WHIMBREL was the toughest since they do not tend to hang around. But then the HUGO could also have left. Resisting the urge to call Patricia Lindasy and Shai Mitra for an update since they were out on the flats, I hauled tail to Dune Road. After an agonizing drive on Dune Road behind someone who decided to drive 10 MPH in a 25 MPH zone, I finally pulled into the parking lot at Cupsogue. A quick change and I was ready for the flats. Only then, did I call Pat Lindsay and she had good news. Pat along with Doug Futuyma and Jim Cullen using his boat had the HUDSONIAN GODWIT on a sand bar known fondly as Pelican Bar. As soon as I could see the bar from the shore, I quickly scoped the location and added number 20 - yay for HUGO. A different bird from Saturday, phonescoped using a MEOPTA adapter with my Phone. 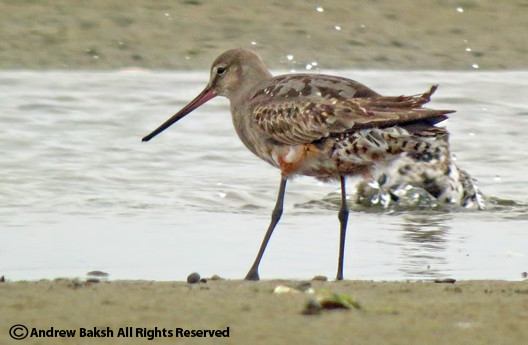 Number 21, I stumbled upon as I headed along the shore; the phone had just rang and I missed the call from Shia Mitra who was calling to let me know the location of the HUDSONIAN GODWIT. I was focused on another call - a bird call, it was the sound of a WHIMBREL calling and as if guided by a higher power, the bird dropped right in front of me. Feeling like I had the blessing of the shorebird god (s), I added number 21 for the day and got some good close up shots. I even had time to snag a photo using my meopta adapter with my iPhone (thank you Mr. Cooper). 21 tied my all time shorebird count; I was confident that I was going to find a RED KNOT for 22 and shortly after I did, enjoying several juvenile RED KNOTS as they loafed on the flats at Cupsogue. I had a new personal shorebird day high count!! Then I picked up number 23 as the winter plumaged DUNLIN I had seen the day before showed up, much to my delight. I was pleased as punch with 23. 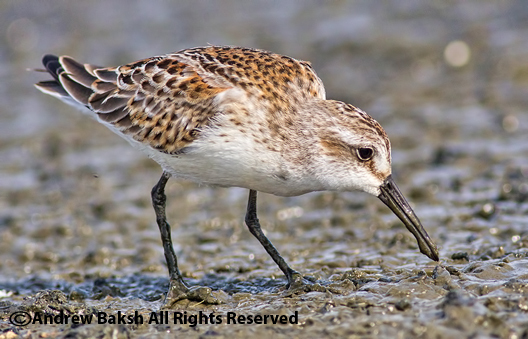 Confirmation of my STILT SANDPIPER made it 24, a fine number indeed and one that I am going to have a tough time beating unless I have one of those really special days at Jamaica Bay!